Now that AT&T has unwrapped their version of shared data plans, it made sense to do a comparison to Verizon’s Share Everything plans. Since these are the two biggest carriers in our country and probably hold more customers between the two than all others combined, these will clearly affect many of you. So in the simplest of comparisons, we have two charts that represent your choices for shared data and their costs, followed by a couple of scenarios to see which carrier would be best meet your needs. *There is a chance that AT&T will add in other tiers, but these are the 6 that they have announced. With shared data plans, you get unlimited talk and text on both Verizon and AT&T. For those just learning about shared data, we’ll try to give you the basic breakdown of how this all works. First, you have a per device cost which essentially accounts for the unlimited minute and text plan that accompanies all shared data plans. So in the past, you paid $69.99 for 700 minutes, but now you are paying upwards of $45 to get unlimited talk and text. With Verizon, the fee is $40 for smartphones at all times – with AT&T, that number starts at $45 and goes down depending on how much data you add on. Basic phones are $30 on either carrier. When you add hotspots, laptops or netbooks, they will cost $20 per month on either carrier. Tablets will run you $10. The low prices for each of these have to do with the lack of a minute plan since you can’t make calls on them. Once you figure out how many devices you are going to attach to your account, you then decide on a data amount. As you can see above, Verizon has more options to choose from than AT&T, but there is a chance that changes in the future. The key thing to remember is that this data amount is shared by all of the phones, tablets, hotspots, and netbooks attached to your account. If you choose the 8GB plan, that doesn’t mean that each device gets to use 8GB – each device gets to pull from one lump some of 8GB. Enough info, let’s talk examples for a second. Example 1: Your family has 2 smartphones and 1 basic phone, so you decide to buy 4GB of data. Verizon: 2 smartphones at $40 per, 1 basic phone at $30 per, and a 4GB data plan for $70. Your monthly bill would roughly be $180 before fees and taxes. AT&T: 2 smartphones at $40 per, 1 basic phone at $30 per, and a 4GB data plan for $70. Your monthly bill would roughly be $180 before fees and taxes. As you can see, it’s a wash in this example on a numbers front. Example 2: You are an individual who uses little data, but needs a smartphone. Verizon: 1 smartphone at $40 per with a 1GB plan at $50. Your monthly bill would roughly be $90 before fees and taxes. AT&T: 1 smartphone at $45 per with a 1GB plan at $40. Your monthly bill would roughly be $85 before fees and taxes. Smartphones owners that use little data, AT&T edges Verizon by a small margin. Example 3: Big family with 4 smartphones, a tablet and a hotspot. You go big with a 14GB plan. Verizon: 4 smartphones at $40 per, plus a tablet at $10 per, and a hotspot at $20 per plus a 14GB data plan for $120. Your monthly bill will run you around $310 before fees and taxes. AT&T: Since AT&T does not have a 14GB plan, we would have to go with the 15GB plan in this scenario. 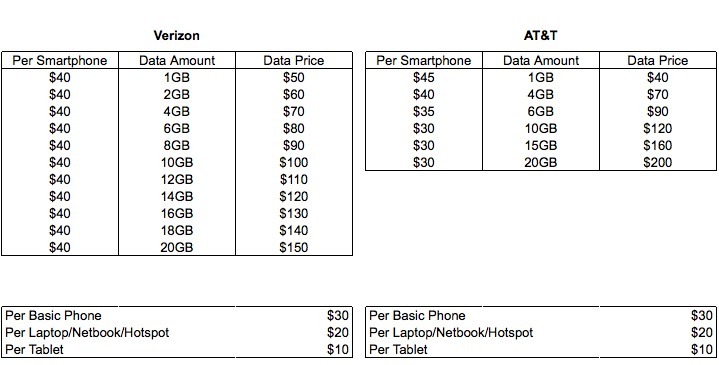 4 smartphones at $30 per, 1 tablet at $10 per, and a hotspot at $20 per, plus a 15GB data plan for $160. Your monthly bill will run you around $310 before fees and taxes. On AT&T, you get an extra 1GB of data and will pay the same price that Verizon customers will pay. While the numbers may look different, especially with AT&T giving you a per device discount as you buy more data, it all comes out the same in the end for the most part. Not only that, but Verizon’s 4G LTE network covers over 300 markets at this point while AT&T’s is in only 47. It would have been surprising to see one to offer a significant discount over the other. In the end, it comes down to carrier preference just like it always has.